You've probably heard the hype about this week's Amazon Prime Day, where the online retail giant has special sales available for one day only. Ordering those books and slippers (and just about anything you can imagine) online can be super convenient! I do my fair share of online shopping, too. But while Amazon may be easy and convenient, they are NOT local - they won't know who you are, show you how to operate your sewing machine, give you advice on your next project, or support your community. We take pride in being here for you every day. And we wouldn't be here without your support and business! THANK YOU, from the bottom of our hearts. 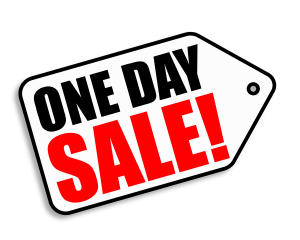 We are slashing prices on featured items in our store - one day only! We have a bunch of great things selected for you. At 50% off - you don't want to miss this! On Tuesday, we will reveal a new 50% off deal each hour our store is open. Watch your email Tuesday morning to see our 10am opening special! Want to see all the deals? Check our page on Tuesday, as we will be posting details about our 50% sale items. To take advantage of ALL our featured deals, come visit us in our store! If you can't make it in - that's ok! You can make your purchase over the phone and pick it up at a later time. Please Note: While we are co-located with Aunt Sassy's Quilts, we are two separate shops. Our featured 50% off deals only apply to Creative Sewing Center merchandise.